What is phimosis and paraphimosis? Phimosis is constriction of the preputial orifice. In phimosis, the foreskin can not be retracted. In paraphimosis, the foreskin can not be reduced back on the glans. It may cause a painful glans swelling going on to proceed to a gangrene. I always mix up the two, so mnemonic! 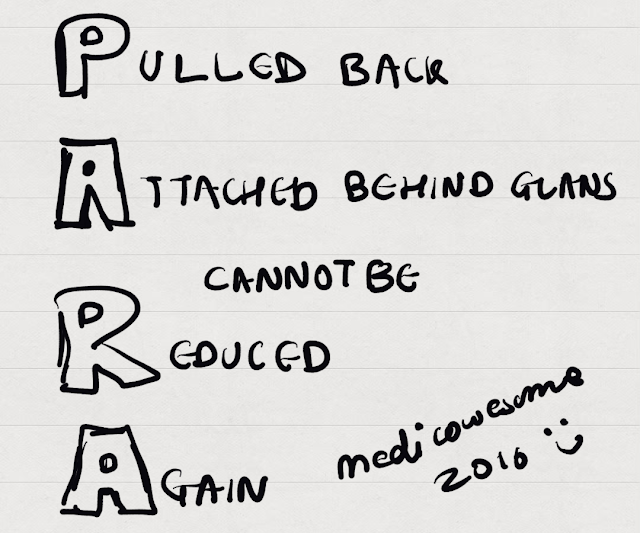 Another mnemonic - Call Paramedics if paraphimosis because it's a surgical emergency. This one was submitted by SG on our study group, "PAra is PAinful."